Tucked in the Marathon County woods just off Highway 52, the Motorama Auto Museum preserves rare and classic cars for past, present, and future generations to enjoy. With over 400 vehicles on display, it’s the largest auto museum in Wisconsin. Motorama calls itself “Alfa Heaven” for its collection of over 50 Alfa Romeos, the largest such collection on the continent. Covering over five acres in all, the museum’s inside features some meticulously preserved models while a Boardwalk guides you through the “Boneyard” outside, a pathway filled with often rusted – yet beautiful – relics in the woods. Vehicles in the Boneyard tend to be mid-20th century models. The vehicles featured by the Motorama Auto Museum focus on not only rarity of models, but also unique engineering design and aesthetics. Models include a 1960 Berkely T60 three wheeler (a quite rare sight indeed), a 1960 Daf 600 electric model they call “Daffy,” a 1955 Buick Wildcat, a one-off prototype Alfa Romeo 165, and many, many more. Among their unique models is the a 1960 SSZ Stradale P2, an exotic ride designed and built right in Marathon County. Along with classic cars, you’ll find old army vehicles, snowmobiles, motorcycles, and more. Motorama’s new additions for 2016 include a 1953 Kaiser traveler and a 1959 Studebaker Lark coupe old drag race car, which will be put into their driving fleet soon. 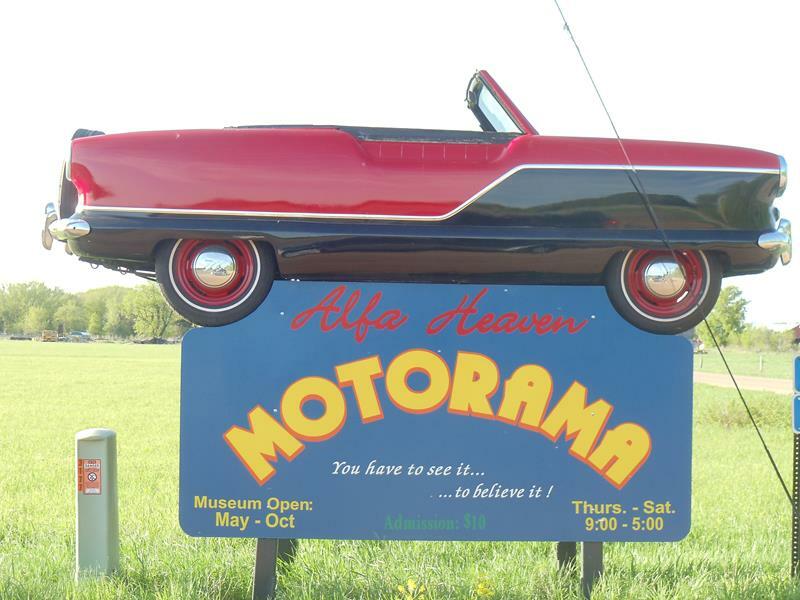 Motorama is open from early May through late October, Tuesdays through Saturdays 9am-5pm. Guided tours are offered at 10am, 1pm, and 3pm. Admission is $10 for adults; kids 15 and under are free. You’ll find the Motorama Auto Museum along Highway 52 just one mile west of its junction with U.S. 45 near Aniwa. This is about 10 miles south of Antigo, right around where Marathon, Shawano, and Langlade Counties meet; Highway 47 is also close by.